Every time we cross the Second Severn Bridge to England, The Boy is fascinated how a 1km long road can be held up by two posts 'and a few wires'. He's asked a few times if we can make a bridge like it, and I'd seen an idea recently about using aluminium foil to construct with so decided to combine the two together. 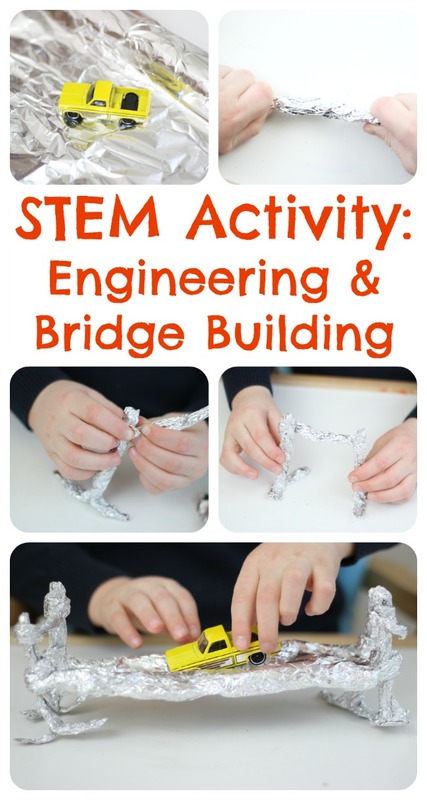 Can you make a bridge from foil strong enough to hold a toy car? I presented The Boy with a roll of aluminium foil and we discussed the texture, fragility and sturdiness. Aluminium foil is typically 0.2mm thick and therefore hardly strong enough as it is to support a moving vehicle in mid-air, no matter how big or small the car! We discussed words like flexible and rigid, and how we could manipulate the foil to make it sturdier; scrunch, twist and twiddle away to test the strongest form. We made four upright posts to support the road at either end of the bridge, and The Boy decided to twist a tether around the top of each post at each end to join them together. The bottoms of the poles were split and splayed to create feet. Next The Boy made a road but couldn't quite work out how to attach it to the actual bridge, he tried balancing it on the top but the foil was too thin and collpased under the weight of the car. He twisted two long supports for the sides of the bridge, which were wrapped around the ends firmly. The road was then placed on top of these side supports and wrapped over to hold it in place. We tested the car and this time the bridge held firm under the weight of the car! What can you engineer from kitchen foil? Wouldn't have thought of doing this activity with foil. It reminds me of a maths fun day we did at school (and a team building work event once) where one of the tasks was who could make the bridge out of newspaper, and which held the most weight. I still remember it now 30 years later. I tried it with gifted students (aged 8) and it was very good. At second step we created bridges with spaghetti. I recommend it too. Thanks a lot.